The Microplus Diving system is fully FINA compliant and it is able to completely manage top level international diving championships and competitions. 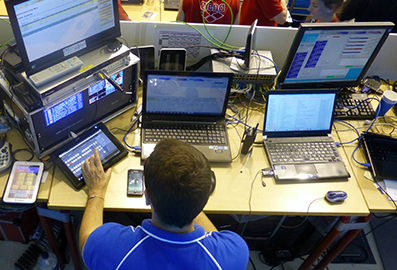 The scoring system is based on judge terminals (PDA) connected via powerful 5GHz Wi-Fi to the OVR system. When the judges score, the scores are immediately listed on the terminal which send the information to the servers (main and backup) for immediate availability to be forwarded where needed: On site and Off side Scoreboards, TV graphics, Remote Printed Distribution System.